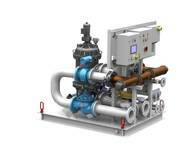 Optimarin to supply three ballast water treatment systems to Siem Offshore vessels. The first ship to be supplied with Optimarin Ballast Systems (OBS) is the AHTS Siem Opal during drydocking. The Type Approved Optimarin Ballast System (OBS), is based on solid separation (filter) as pre-treatment and high doses of UV irradiation for inactivation of marine organisms, viruses and bacteria, without affecting the normal operation of the ship. Ballast water is UV treated both during ballasting and de-ballasting to ensure the dual UV effect. Ballast water is only filtered during ballasting. Since the beginning of 2010, OptiMarin AS has received eight orders for the type approved ballast water treatment system OptiMarin Ballast System (OBS). The orders are placed by yards on behalf of major ship owners. • Four Platform Supply Vessels that K Line Offshore AS are building at STX Norway Offshore AS Brevik. The vessels are of the STX PSV 06 CD design and the technical management of the vessels is entrusted to OSM Shipmanagement AS. • Two Anchor Handling Tug Supply Vessels that Siem Offshore are building at Kleven Maritime. The vessels are of the VS 491 CD design.